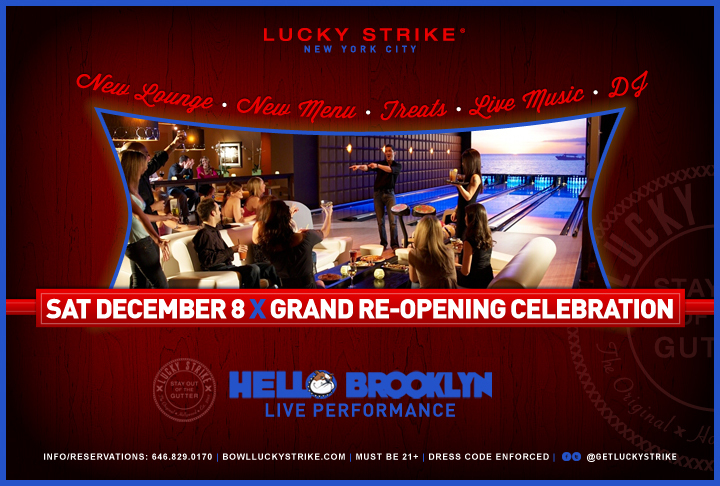 Lucky Strike Lanes in Manhattan will celebrate its latest setup after substantial renovations following Hurricane Sandy, with a big event on Saturday, December 8 starting at 9pm. The event is open to the public and will offer guests specials on the new food and drink menus. With construction crews working round the clock on the renovations, the staff was determined to reopen their doors to the public and accomplished this feat in a mere 17 days. The new look and feel of the space lends a unique combination of a vintage vibe with contemporary décor- perfect for upcoming holiday parties, special occasions and nights out. Lucky Strike will début their new menu, with options of shared plates such as Fish or Short Rib tacos, Smokey Grilled Buffalo Wings, and Belgian Fries to name a few. This Saturday night, Lucky Strike Lanes in Manhattan will thank their community and loyal customers for their continued support while they, and the neighborhood, recovered. No user commented in " GRAND RE-OPENING CELEBRATION FOR LUCKY STRIKE LANES "